Around the state leagues: Who starred for your club? Ruckman Reilly O'Brien was the Crows' best in their 33-point loss. The 22-year-old, who has played two senior games, had 18 possessions, 36 hit-outs, seven clearances and six tackles. Nineteen-year-old Matthew Signorello was prolific in the midfield (22 disposals, 12 tackles and seven clearances), so too was rookie Patrick Wilson (29 touches and a goal). Alex Keath (15 touches, five marks) and Curtly Hampton (17 disposals and a goal), who were both returning from injury, performed well. Elliott Himmelberg and Harry Dear both booted two goals. Josh Walker was on fire for the Lions in their 66-point rout of Redland. The key position player, who has made four appearances at the top level in 2018, booted six goals and had 22 possessions (16 kicks, six handballs). Hard-bodied midfielder Tom Bell again put his hand up for a promotion with the former Blue amassing 24 touches (16 kicks, eight handballs), one goal and seven tackles. Utility Ryan Lester, a veteran of 107 senior games and a member of the Lions' leadership group, gathered a team-high 28 disposals (15 kicks, 13 handballs), took seven marks and kicked a goal. Brisbane Lions Academy graduate Connor Ballenden bagged five goals straight and had 18 touches. Talented second-year player Tom Williamson made a promising return in the Northern Blues’ 38-point loss to Box Hill Hawks at Box Hill City Oval on Saturday. In his first game for the season after overcoming a back injury, the 19-year-old left-footer gathered 15 possessions by half-time, including 10 in the first half, before sitting out the latter part of the contest after playing his allocated minutes. David Cuningham (24 touches) got better as the game wore on and finished off his work with a long, bouncing goal. Jacob Weitering continued to build towards a senior recall with 17 possessions. Young forward Jack Silvagni kicked one of the Blues’ two first-half goals after taking a terrific mark. Young midfielder Brayden Sier continues to make a strong case for an AFL debut after piloting Collingwood to a 25-point win over VFL rival Coburg at Piranha Park on Saturday. Sier won 35 possessions (10 kicks and 25 handballs) and laid six tackles in another impressive effort that suggested he is ready for promotion. He worked well in the Pies' engine room with Rupert Wills (32 and eight tackles) and Josh Daicos (29 and five tackles). Flexible first-year player Nathan Murphy was also among the Magpies' best with 19 touches, including 17 kicks. Rookie defender Brody Mihocek (21 disposals and nine marks) was a stumbling block all day for Coburg, while dropped forward Ben Crocker kicked two goals from 13 touches. Omitted pair Darcy Parish and Ben McNiece responded strongly in Essendon’s seven-point VFL win over Geelong at Windy Hill on Saturday. Parish and rookie McNiece were among the Bombers’ most prolific ball winners in performances that should have them in the senior selection mix. Ruckman Matthew Leuenberger was workmanlike and Aaron Francis continued his good form in defence. In attack, the versatile Mitch Brown kicked three goals while small forward Josh Green also chimed in with three majors, two of them from snaps in a tense final term. Troubled midfielder Harley Bennell got through his second game back from a calf strain unscathed. Bennell, who has battled on- and off-field issues, gathered eight touches and kicked a goal in about 70 minutes of game time. Rookie Stefan Giro was Peel's best, the elite-running midfielder amassing 27 touches, laying nine tackles and booting a goal. Fellow rookie Luke Strnadica continued his fine season, the big man with 12 touches, 18 hit-outs and two goals. Ethan Hughes (22 possessions), Tommy Sheridan (21) and Shane Kersten (19) were all busy. Ruck/forward duo Rhys Stanley and Wylie Buzza kicked seven goals between them in a seven-point loss to Essendon in the VFL at Windy Hill on Saturday. Stanley, who played five of the opening seven rounds at AFL level, slotted four goals while Buzza added three, including two in a tight final term. Fellow big man Ryan Abbott also performed strongly and hit the scoreboard. Teenager Jamaine Jones, who contributed two goals, was named the Cats’ best player. FANTASY FORM WATCH Who gets rage-traded this week? Veteran midfielder Michael Barlow racked up 41 disposals (26 kicks, 15 handballs) and kicked a goal in the Suns' 37-point loss. Kade Kolodjashnij was also busy, the 22-year-old collecting 32 touches to go with 14 marks, while rookie Jacob Dawson amassed 31 possessions. Youngster Wil Powell was lively with three goals and 16 disposals. 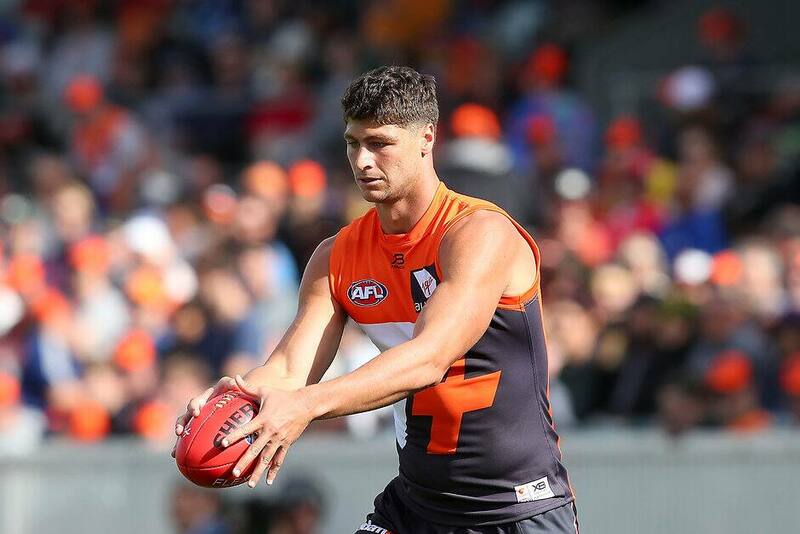 Jonathon Patton regained some much-needed form in the Giants’ 51-point loss to Canberra in the NEAFL Clash at UNSW Canberra Oval on Saturday. In his second NEAFL clash since being dropped for the first time in his career, Patton made the most of limited opportunities to kick three of the Giants’ 11 goals. Rookie Zach Sproule (29 possessions) and Nick Shipley (27) were prominent runners while Matt Buntine was particularly good in the first half. Ruckman Dawson Simpson won many hitouts and possessions and small forward Brent Daniels was dangerous. Jonathon Ceglar was dominant in the ruck, finishing with 29 touches and a goal in Box Hill's 38-point VFL win over the Northern Blues at Box Hill City Oval on Saturday. Fellow big man Ryan Schoenmakers kicked three goals in a fine forward display. He was well fed by the likes of Kieran Lovell (29 touches and a goal), Brendan Whitecross (24 and two goals), Teia Miles(26) and rookie Dallas Willsmore (24). Cameron Pedersen bagged six goals in Casey Demons’ 106-point win over Frankston in the VFL at SkyBus Stadium on Saturday. Pedersen, 31, hauled in several spectacular marks and had his sixth goal on the board before three-quarter-time. Smaller man Tom Bugg also enjoyed a day out with five goals. He and Pedersen capped their goalkicking with 22 disposals apiece. Jayden Hunt was typically energetic in gathering 23 possessions. Jeff Garlett kicked one goal in his bid for a senior recall. Luke Davies-Uniacke ensured his name will be raised when the senior selectors meet after an accomplished performance in North Melbourne’s eight-point win over reigning VFL premier Port Melbourne at North Port Oval on Saturday. The prized draftee showed great class in the Kangaroos’ midfield, where he was well supported by the likes of tenacious little man Nathan Hrovat. Ben McKay was a tower of strength in defence, taking a swag of strong marks, while up forward Nick Larkey kicked three goals and was particularly conspicuous early. Rookie tall Oscar Junker was moved forward in the third quarter and kicked two goals. Premiership forward Daniel Rioli made a successful return from injury in the Tigers' 65-point win over the Zebras in Beaconsfield. Playing his first game since breaking his left ankle in the final quarter of last year's AFL Grand Final, Rioli played the first half before watching the second from the bench. Shai Bolton kicked the first goal of the day, but a corked quad in the third term ended his day prematurely. Connor Menadue (24 disposals) continued his good form at the lower level, while Oleg Markov, Corey Ellis and Tyson Stengle were all very good. Rookies Mabior Chol and Callum Moore both kicked two goals. FT: Very pleasing to apply some scoreboard pressure and run away with it in the second half. Nathan Freeman sustained a shoulder injury in Sandringham's 65-point VFL loss to Richmond at Beaconsfield on Saturday. The down-on-his-luck midfielder, who had been in great form in his first two games back from hamstring surgery, suffered an AC joint injury in the first quarter. In more positive news on a disappointing afternoon for the Saints, defender Brandon White had a team-high 33 possessions. Daniel Robinson responded to his omission from the senior side with a game-high 40 disposals (23 kicks, 17 handballs), plus 10 marks. Robinson was supported by Nic Newman (34 possessions and two goals), Robbie Fox (31 touches), Dean Towers (29) and Colin O’Riordan (29, as well as 11 marks), as the Swans ran out 88-point winners. Aliir Aliir was busy in defence, attack and the ruck, finishing with 21 touches and a goal. Omitted for West Coast's clash with Richmond, key defender Will Schofield went off with a hamstring issue in the opening quarter and took no further part in the game. Brayden Ainsworth, who was also dropped from the Eagles, was busy with 27 disposals and two goals. Jackson Nelson (19 possessions) and Matthew Allen (21 disposals and one goal) worked hard all day. Dale Morris' welcome return from injury was a resounding success, with the veteran defender running the game out strongly. Playing his first game of the season following a partial tear of the anterior cruciate ligament in his knee at training in late February, Morris finished with 13 touches. Josh Schache was again prominent up forward, the former Lion with 11 possessions, three goals and six marks. Shane Biggs (27 disposals), Lin Jong (26 and a goal), Callum Porter (20 and a goal) and Tim English (19) were among the best for the Bulldogs, who survived a late scare to win by eight points. Rookie Nathan Mullenger-McHugh - the Bulldogs' first selection in the 2016 NAB AFL Rookie Draft (pick 18 overall) - booted two goals.